This past summer, Wizards of the Coast released three premium reprints of the original Gary Gygax-penned AD&D rulebooks. These were well received by the old school community (despite the usual nitpicking), leading some to hope that perhaps this might presage the return of more AD&D books or even the game's becoming permanently "in print" again. While the latter seems like a pipe dream to me, eagle-eyed Joseph Browning has found confirmation that, yes, we will be getting another AD&D rulebook reprinted -- Unearthed Arcana in February 2013. The choice of Unearthed Arcana is a strange one, given the relatively low regard in which it's held by most old schoolers. On the other hand, it carries Gary's byline (even though it contains work by others) and, unlike Monster Manual II, which is also by Gygax, it's player-oriented. Plus, the original Unearthed Arcana was renowned for the shoddiness of both its editing and its binding. If the reprint corrects both those issues, it'd go some way toward making it a more attractive buy. I'd still rather that WotC reprint something like the LBBs or Moldvay/Cook, but I'm not going to complain about seeing more AD&D on the shelves of game stores. If anything, it suggests that the original batch of reprints must have sold decently enough. I can't imagine WotC would bother with a follow-up volume if the previous release had been a bust. I know I had only passing interest in the PHB, MM & DM reprints, because I have multiple copies of the originals. However, I am interested in a UA reprint, because the original binding was crap, so I have a bunch of loose pages rather than books. I will disagree with your "given the relatively low regard in which it's held by most old schoolers". I play with a group that has played together since High School (we are in our 40s now) and outside of the folks "online" no one has had issues with it. During our long gaming history of gaming with AD&D (including lots of Cons) it has been enjoyed. The only "most old schoolers would agree" bit about the UA I would believe is that they all had really crappy bindings. Now had you listed Wilderness/Dungeoneers Survival guides as mostly disliked by "most" old schoolers I would probably agree. I hope the MM2 makes a reprint as well so I can have all my original books... all fresh and new. My old ones are yellow and faded. UA's glue was a disaster. That book broke after a week of light reading. I was excited for it until I read it and was underwhelmed with its contents. I distinctly remember thinking the book was a husk of former glories - a knock-off, a sign of trouble at the company. It was my launchpad to RoleMaster, in fact. Funny, now that I've read it again, I agree with Celestian - I think it is a perfectly ok book, an innocuous take-it-or-leave it supplement, unlike the Survival Guides. But that glue, man. That was a trainwreck of production values. In the 2012 WotC Keynote, they did mention that they are going to release their entire back catalogue in a digital format. I imagine they are going to be released as kindle or nook files to be read instead of scanned pdfs. TSR was nice enough to give all the crappy AD&D books an ugly orange spine to make them easy to avoid or purge from your collection. In my AD&D game, I made a choice to not allow Unearthed Arcana (or any of the other books after that - basically 84/85 and up). In small part because I was not impressed with classes like the cavalier, but also because I feel that the game's "tech" advances more towards the late Middle Ages/Renaissance and I like to have a more Dark Ages level (in general). Now while I could start picking out bits and pieces of what's allowed, I decided to just avoid the whole thing and stick with the more original AD&D. What a waste of paper to reprint this rulebook. I did like the cover art, but TSR could have come out with Official AD&D Toilet paper that would have been more useful (or at least more absorbent) than Unearthed Arcana. I don't know. I find the news interesting. In 1985, I seem to remember looking forward to having a number of official/non-official rules from Dragon magazine clarified and given blessing. The scope of the book: additional details for races; new (and anticipated from Dragon magazine) character classes, new spells, new magical items, non-human deities, and even the 'nomenclature of pole arms' was worth the money I earned as a restaurant dishwasher. It was like a hardback, "sanctioned," box of 'goodies,' in the day. A formula that Wizards of the Coast would later emulate in a great deal of their publications. Is that good or bad? I'm fond of UA, partly because mine is signed by Gary :) , but also because I felt free to ignore those parts I didn't like (Barbarians, for example) and use those parts I did. (I recall loving many of the new spells.) To be honest, the reprint of the old AD&D volumes doesn't mean much to me, because the modern OSR clones are themselves excellent games. But I'm happy to see them come out, if only because nostalgia for some very enjoyable sessions and groups. I like UA. The Barbarian & Cavalier classes were a blast to play. I don't see the point in reprinting them. The new D&D game is way better. There are some useful bits in the UA, but all of them have to be carefully considered. When there is a spell that takes up a first-level spell slot that can cause a save vs. death (with a successful save still meaning paralysis), then it is clear that development was inadequate - by which I mean that there is much in there that was clearly never used in actual play. The only part I used was the weapon specialization for fighters and I quickly found it unbalancing. I suppose it makes sense in a way, but I would much rather see Fiend Folio or even Monster Manual II reprinted. I remember being a little bit excited by UA just because I'd read lots of it in Dragon and now all of a sudden it was a real book...but even at the time I was conscious that those Dragon articles mostly kind of sucked. And if they're going to reprint something that mostly kind of sucked, I'd totally favor Fiend Folio, just for the cool art and pervasive weirdness. Either WotC want to reprint UA because they see it as some kind of "expert expansion" for AD&D that's the most important book of this edition after the 3 core books - or the AD&D reprint was more successful than WotC expected it to be, and they're now deliberately reprinting a book they'll expect to sell very poorly so that they can use the low UA sells as a "weapon" against the people of the OSR who want more old editions back in print. I'm certainly interested. As someone who missed the 1e era it's been interesting to read through the other reprints. All of that being said though, from what I've heard and I think my current interests in gaming I'd be more interested in a reprint of the Rules Cyclopedia. Yes, the sales of the core 1e reprints must have done well financially, considering the extensive process that was required to restore them. I didn't get any of the first set of AD&D reprints (though I may at some point). 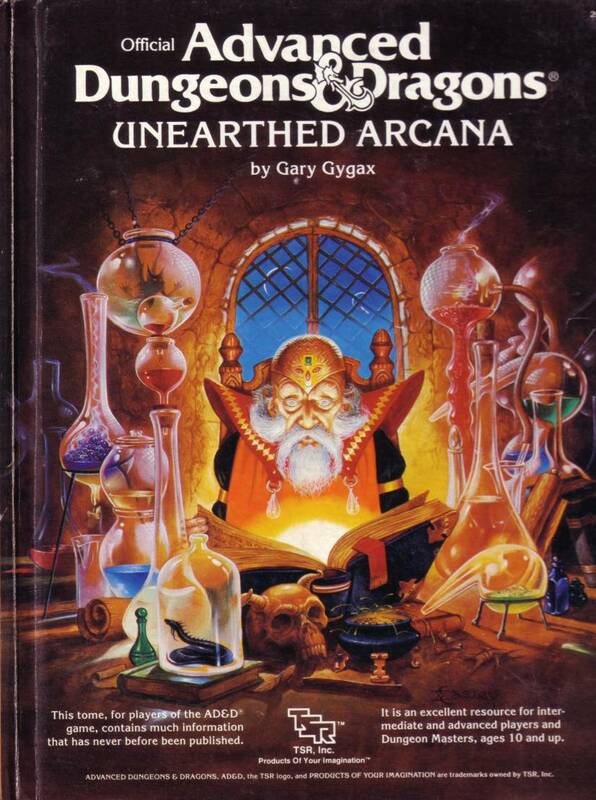 Although I agree I would rather get a red or blue box reprint, or the Cyclopedia, or best of all the little brown books (which I don't have), I will almost certainly pick up Unearthed Arcana, just because of the binding issues in my copy. Actually, I would happily pick up MMII, Oriental Adventures, or the Dungeoneer or Wilderness Survival Guides for the same reason. I'm sorry, what? I think you forget that WotC's goal is to make money, not champion some abstract ideal of new gaming in opposition to people who want more old editions back in print. Unearthed Arcana may not be the darling of the OSR, but historically speaking, it does have a lot of "stuff" in it that made it into 2nd edition. If WotC's goal here is to get the history of the game into print as a context for 5th edition, then publishing UA makes sense. They should just reprint the 3LBB's in an attractive box set. bought all 3. havent opened them yet. 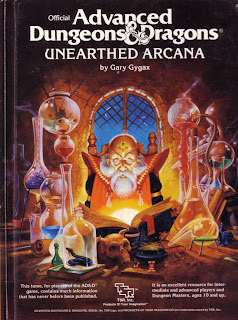 loved unearthed arcana (what an epic title for a far-from-jaded kid). my copy never fell apart but it was left at a friends house. picked it up a half price books for 7 bucks in near mint condition a while back. never had an issue with the binding. as an aside, the dungeons and dragons and philosophy book is great. some awesome chapters in there by Morton, Bryant and others. They want to make money, but I'm sure they'd like this money to come mainly from the new edition they're cooking, since making a new edition ain't cheap. Then again, I'm terrible at making conspiracy theories, so maybe they DO think UA is worth reprinting. My copy is almost perfect shape... seeing as it was never used in a real gaming context. I was the only one in any of my regular groups who ever bothered to buy it, so none of the options it provided ever got used. It also came out towards the end of my teenage gaming career. I was surprised when I went back to revel in D&D nostalgia on the web a few years back to learn exactly how almost universally hated this volume was. I always kinda liked it! Though, like I said, I never really got a chance to use it at the table... so I probably never got the chance to see it's various problems in action. I was always the type to try to put any unofficial Dragon Mag idea or variant into use ASAP anyway. More "Official" books with more options was right up my alley at the time. I might feel differently today... seeing as I barely have time to read through or play all these games after work and responsibilites, more rules to catalog and memorize definitely isn't the way I'd want to go today. If they print Unearthed Arcana with the errata from Dragon #103, then I will definitely buy it. I don't get the hostility for the book. So some of the rules are poorly thought out and a few are downright stupid. This separates UA from the other AD&D hardbacks how, exactly? Just like the PHB and DMG. Loved the expanded spell lists and magic items. I'll be putting on my list. While the binding was obviously poorly done I didn't realize this book was held in such "low regard" until the internet. Interestingly enough, I was thinking the opposite; that it was a telling sign that it was not in general merged into the 2nd edition. Comeliness disappeared, as did cavaliers and barbarians and thief-acrobats. Weapon specialization stuck around. I don't know what else made it into the PHB or DMG of 2nd edition, but it does seem like far more was rejected then was kept.